LINCOLN, Neb. — MacPractice, the leading Apple developer of practice management and clinical software for doctors’ offices that use Macs, iPhones and iPads, announced today the launch of the MacPractice Clipboard 4.2 and MacPractice Patient Check In Apps for iPad and iPad mini. Both Apps work with MacPractice MD, DDS, DC and 20/20 desktop practice management and clinical software. The MacPractice Clipboard 4.2 App streamlines patient registration for US users and enables doctors’ offices to use customized template forms for the first time. The MacPractice Patient Check In App automates check-in procedures and helps ensure HIPAA compliance. Both Apps leverage the efficiency and ease of use of Apple’s innovative iPad and iPad mini to eliminate paper and redundant data entry by patients and staff, save time and reduce the risk of data entry errors. “The MacPractice Clipboard 4.2 App pre-fills patients’ forms for verification and completion by them on the iPad or iPad mini,” said Mark Hollis, MacPractice CEO. “Patients register, provide intake information and their medical and social history, sign release forms, and take their own photo, all using Clipboard. Once patients review a summary of what they have entered and are satisfied, they tap a button on the screen to automatically send all their information into the office’s MacPractice software. “Patients love that Clipboard eliminates the necessity of providing the same information multiple times to the office. Staff love that Clipboard eliminates redundancy for them as well and enhances their productivity by making it possible for patient- entered data to be sent directly from the iPad into the patient’s record in MacPractice on their desktop. The MacPractice Clipboard App allows office staff to review insurance information, and established patients can update their own information to ensure that the practice has their most current data. MacPractice plans to release a version of MacPractice Clipboard for its international users in 2013. The new MacPractice Patient Check In App for iPad and iPad mini also streamlines office procedures – and helps practices ensure they comply with HIPAA regulations. “At many doctors’ offices, patients check in by writing their name, arrival time and the reason for the visit by hand on a sign- in sheet at the office reception window,” Hollis continued. “This is a problem from a HIPAA compliance perspective since sensitive data is publicly displayed. It’s also inefficient because the office staff has to then re-enter the information into the practice management system. 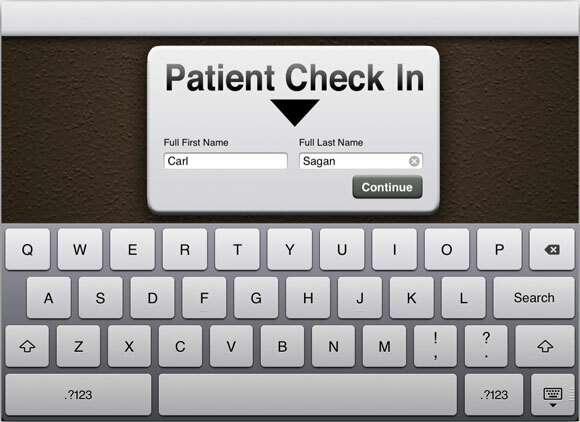 With MacPractice’s Patient Check In App, patients enter their identifying information on the iPad or iPad mini, which automatically records their arrival time and updates their appointment status in MacPractice MD, DDS, DC and 20/20, alerting clinicians to the patient’s arrival. The MacPractice Clipboard 4.2 App for iPad and iPad mini can be downloaded for free from Apple’s US App Store. MacPractice MD, DDS, DC and 20/20 users pay a $200 annual support fee to enable their MacPractice software to work with MacPractice Clipboard 4.2, a charge that should quickly be offset by the time savings, elimination of duplicate entry and paper and error reduction benefits the App delivers. The MacPractice’s Patient Check In App for iPad and iPad mini can be downloaded from Apple’s App Store and is free for users of Scheduling in the recently released version 4.2 of MacPractice MD, DDS, DC and 20/20. For more information about the MacPractice Clipboard 4.2 App or the MacPractice Patient Check In App for iPad and iPad mini and other innovative MacPractice solutions, please visit MacPractice.com/ iPad and register at MacPractice.com to view demo videos of all MacPractice software for doctors. MacPractice leverages Apple’s legendary ease of use, stability and low-cost maintenance to create affordable, intuitive and flexible Mac-native software for doctors. The software, currently used by 15,000 providers, combines a state-of-the-art ONC-ATCB 2011- 2012 Certified EHR/EMR solution with practice management tools in an easy-to-use, intuitive system that can improve patient care, efficiency and productivity.